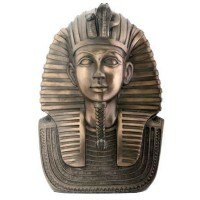 This black basalt finish cold cast resin bust depicts King Tut wearing the blue crown of war. 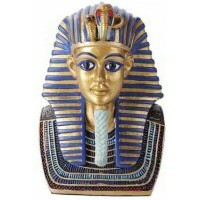 The blue crown was worn in battle, here shown on a bust of King Tut. The cold cast resin finely detailed statue has a black basalt stone finish and measures 4.5 x 3.5 x 6.25 inches. 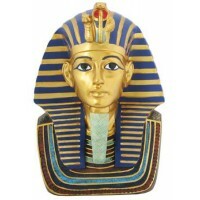 Item Number: YT-7869 | Approximate Size (Inches): 4.50 wide x 3.50 deep x 6.25 high | Approximate Shipping Weight: 3.00 lbs.